Who doesn’t love the light and bright homes of the Hamptons and the classic Hamptons style? The fresh, country-meets-coastal theme is a popular choice in many homes, however, the luxe nature of Hamptons-inspired design tends to come with a big price tag. If you aren’t looking to spend a fortune on decor and furniture for, here are 6 ways that you can achieve the highly desired Hamptons luxe on a budget in your home. Candles of different sizes, shapes and fragrances are a super easy way to achieve that light Hamptons feel. Even using some basic white pillar candles and doing a little crafty D.I.Y on them with some rope or shells is a perfect budget-friendly option in making some luxe-looking mood lighting without the expensive price tag. Pop these in the center of your coffee table in your lounge room or on a shelf in the living area or hallway. Changing up your ceiling lights to a really clean and crisp modern chandelier can master the chic, coastal look. Whilst you may not think it would make a big difference, a key feature of Hamptons styled homes are their statement lighting choices, so spend a little extra time and cash from your budget to ensure you choose the best lighting to complement the theme. This is a super easy and afforable way to create a relaxed vibe in your home. 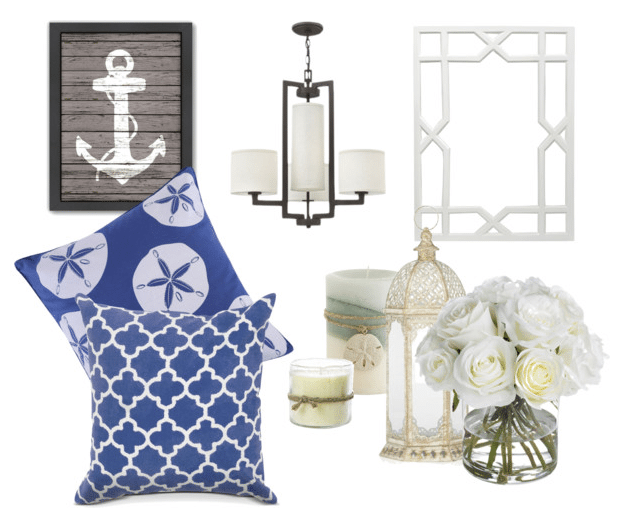 Adding in patterned pillows that are blue and white help to bring the ocean to your home, whether you are near the beach or not. These can be thrown on your lounge, on your bed or simply on various chairs around the home to add a personal touch and bring a touch of color and texture into each room. Now you don’t have to purchase an expensive piece of art, you could even D.I.Y your own piece of art to hang on the walls. Think of things like anchors, shells, water and boats for your statement artwork. These are relatively easy to create if you are doing it yourself, and if you have cash to splash, a great piece of art can make or break a room, so choose wisely and always go with something you love. Flowers always give a summery, beachside touch to your home, and for a Hamptons style, go with white blooms specifically. Simply adding in a vase of gorgeous, fresh white flowers is a great way to breathe life into your room all year round, it’s affordable too and you can change it up every week! If you want to achieve the Hamptons look of big open rooms and floor-to-ceiling windows, add some white framed mirrors into one of the key rooms in your home to create the illusion of space and brighten up the room. You could even restore an old mirror with paint, spray paint or bedazzled jewels for the perfect Hamptons luxe look.